Get certified today. 100% online. We offer multiple ways to study, including in-browser modules, PDFs, videos, and audiobooks. You can take the exam as many times as you need to pass. Not quite finished? You can save your progress, as well. After passing, you get instant access to your provider card and certificate to download or print. Need a printed card? No problem! We’ll send you your printed card within 5-7 business days. *For those that qualify for free or paid shipping. Complete your certification on your time, whenever and wherever you want. You can even save your progress. We’re accepted by over 98% of health care providers nationwide. If yours doesn’t, we’ll refund your purchase. No questions asked. 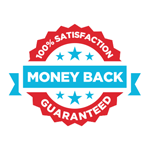 If you somehow aren’t satisfied, or if your health care company isn’t in the 98% that accept us nationwide, we’ll refund 100% of your purchase. Guaranteed. We recommend AMC to our providers and to anyone exploring AMC as an option for obtaining or renewing a certification. Our providers are able to take their certifications on their own time. The digital card was accessible as soon as I passed my exam! I was able to show it to my employer the next day.